The Dualsim adapter SIM2Be Case 4 allows to use two SIM cards (micro-SIM and/or SIM standard format) in one iPhone 4 or iPhone 4S. You can use two different numbers on one phone. Turn your iPhone 4/4S into a dual SIM card phone. A manual switch on the SIM2Be's back allows you switch between your two SIM cards easily. Just 1 click to switch from one number to the other. The Dualsim Case SIM2Be Case 4 is placed directly at the back of the iPhone 4/4S and is compatible 3G UMTS 4G LTE. 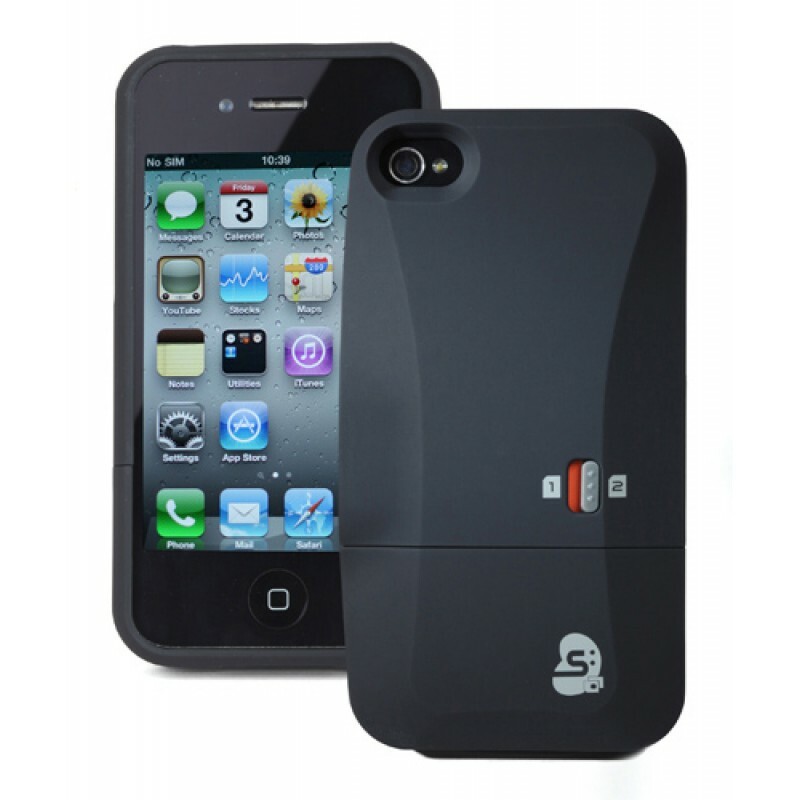 Thin and lightweight, the Dualsim Case SIM2Be Case 4 also protects your iPhone 4 or iPhone 4S from scratches and shocks, offering an additional protection. Design, compact and modern, the SIM2Be Case 4 Dualsim Adapter is the ideal partner for your iPhone 4 or iPhone 4S without altering the aesthetic look and feel. SIM2Be Case 4 Innovation: No software installation required. Easy to install - Without jailbreak. Centralize data of your two SIM cards (phone book, SMS, call logs ...) on one mobile. Do I need to jailbreak my iPhone to use the dual SIM cover SIM2Be Case ? No, the Dual SIM adapter SIM2Be Case doesn't require the jailbreak of your iPhone. How to switch from one SIM card to another ? Simply move the manual switch placed on the case's back to the left or right to change the SIM card. Does the dual SIM SIM2Be Case support a connection with LTE-4G-UMTS-HSDPA-3G-WCDMA ? Yes, SIMore guarantees a connection with LTE-4G-UMTS-HSDPA-3G-WCDMA for SIM2Be Case range. Can we go on the Internet and make video conference calls with the dual SIM adapter SIM2Be Case ? Yes, SIM2Be Case can go online and make video conference connections via LTE-4G-UMTS-HSDPA-3G-WCDMA. Can I receive calls, SMS or MMS on both SIM cards at the same time with the dualsim SIM2Be Case ? Your iPhone is equipped with one transmitter and one receiver, it can not connect simultaneously 2 SIM cards on 2 different networks. You choose which SIM card you want to use (SIM-1 or SIM-2). Does the dual SIM cover SIM2Be Case consume my iPhone' s battery ? No, this adapter does not consume the battery life of your iPhone. Is the original operator menu STK (SIM Tool Kit) still available ? Yes, the original operator menu STK remains accessible into your iPhone's main menu.